Apartment Hanaa is a luxury self-catering two bedroom two bathroom apartment situated on one of Europe�s most prestigious golf developments, Vila Sol. Apartment Hanaa provides an ideal holiday location in the heart of the Algarve, only 25 minutes from Faro airport. It offers everything you would need for the perfect golfing or family holiday. Health SPA, Private beach, 27 championship holes, three swimming pools, Jacuzzi, and a child friendly environment await you. Discounts for occupiers and my representative in the Algarve will look after you during your stay. Vila Sol offers a relaxed family environment where younger children can play in safety around a shallow purpose built pool, whilst parents relax on a myriad of recliners. Vila Sol offers an ideal location to soak up the Portuguese sun, which is a constant part of any holiday on the Algarve. The on site 5 star hotel and golf club house give guests of Apartment Hanaa the choice of high quality restaurants and bar. There is also a tennis academy and gym facilities. Apartment Hanaa is a luxury two bedroom two bathroom self catering apartment which can sleep 6 comfortably in beds. The master bedroom has an ensuite bathroom. It has a large kitchen with all the modern comforts: dishwasher, washing machine, tumble dryer, microwave, fridge freezer, microwave and cooker. Apartment Hanaa has an extensive range of crockery and cutlery in order to make your stay and home away from home. There is a large lounge/dining room, both of which are furnished to a very high standard. Guests enjoy the use of satellite television (with English channels), a DVD player and stereo with CD player. There is also a television with satellite television in the master bedroom. Leading from the lounge is a balcony overlooking the swimming pool area. Enjoy your breakfast on the balcony before going down to the pool for lunch. The sun covers the terrace through out the day allowing for sundowners before heading out for dinner. Apartment Hanaa can also arrange a daily maid service and we provide our own towels and sheets. Apartment Hanaa is situated on the famous Vila Sol golf course, which has 27 championship golf holes contained in 3 loops of 9. The course, which has won awards for its environmentally friendly design, has twice hosted the Portuguese Open. It also plays host every year to the Sir Bobby Robson Classic when celebrities from the world of British sport put themselves under the golfing microscope. There is also a golfing academy with resident professional and driving range. Apartment Hanaa�s guests benefit from a 30% discount on all golf standard rates. If Vila Sol becomes too easy for you, then Apartment Hanaa�s location puts you with in a 15-minute drive of at least 15 other golf courses. The Algarve is a golfers dream. Staying at Apartment Hanaa gives you use of Vila Sol�s own private beach. Only a 15 minute drive from Apartment Hanaa and you will be mixing with the celebrities who frequent this 1 kilometre stretch of golden beach. 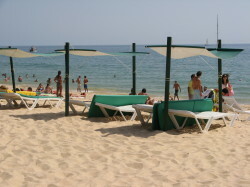 Beach loungers are provided for guests, as is water sports equipment at a small cost. This luxury beach also benefits from its own beachside restaurant allowing you to sample the delights of freshly grilled fish. Only 25 minutes from Faro airport, Apartment Hanaa benefits from being close to the heart of Vilamoura, with its stunning marina and abundance of championship golf. Vila Sol forms part of the famous �golden triangle� of resorts frequented by some of the world�s most famous people. There is an unlimited range of restaurants and bars for the whole family to enjoy. For the children Apartment Hanaa is also 5 minutes away from one of the Algarve�s biggest water parks and 15 minutes from its own stretch of golden beach. Weather: The Algarve has beautiful weather all year round. Hot and sunny in the summer, the weather in winter is equivalent to a British autumn. Ideal weather for a summer holiday or for golfing. Transport: A rental car is recommended. Vila Sol is only 25 minutes from Faro airport. Beaches: Vila Sol's private beach is a 15 minute drive away although there are beaches closer in nearby Quarteira. Vila Sol beach has a wonderful beach restaurant to enjoy the delights of the local sea food. Golfing: Algarve is world famous for its golfing. 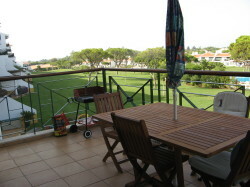 Apartment Hanaa is locted on Vila Sol golf course, one of the best in the Algarve with 27 championship holes which have hosted the Portuguese Open. Discounted rates for those staying at Apartment Hanaa. Within a 20 minute drive there are at least 15 other championship courses. A golfer's paradise. Airport Information: Faro airport is served by a variety of low cost and charter aircraft from all over Europe. There are good car rental facilities. Children Activities: Apartment Hanna is an ideal location for children. It has 2 paddling pools for the youngsters and three other pools for the better swimmers. There are always other children to play with. Local attractions for children, including the giant water park 5 minutes away, will mean that your child is kept busy throughout the holiday. Local Restaurants: A variety of local restaurants catering for all tastes. In a two week holiday, you would never have to eat at the same place. The close restaurant is just across the road and provides a good Portuguese and European menu.